We have 11 years left before a chain of events which leads to societal collapse begins. It's time for radical political change. Deep uncertainty is fairly normal for young people. We’ve grown up in a world crippled by neoliberalism, corporate greed and extractive principles. We know what it’s like for the security of our future to be totally unclear. This is why many young people are apparently unfazed by the fact that their freedom of movement, economic stability and continental solidarity are threatened by the UK’s infantile politics. This is not to say we are politically disengaged. Quite the opposite. The most exciting and deeply political movement sweeping Europe and the world is FridaysForFuture. This is the movement of young people striking from education to demand an immediate overhaul of climate policy and the introduction of legally binding measures to keep global temperature anomaly below 1.5C. FridaysForFuture is everything youth politics should be. It’s exciting, ambitious, democratic and it’s necessary. We recognise and fear the existential threat posed by climate breakdown. The latest report from the UN’s IPCC suggests we have around 11 years left before a chain of events begins that will end in societal collapse, mass displacement, starvation and the eventual extinction of humanity. These prospects are worse than scary and young people’s expansion of the narrative surrounding ecological breakdown to include ideas such as mass extinction is making those in power very uncomfortable. 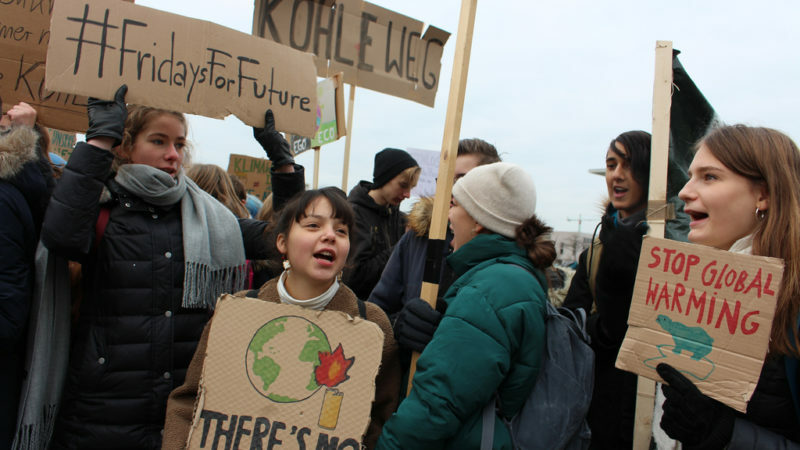 Vitally, young people are acknowledging the link between planetary degradation and the roster of social issues that have also come to the fore in the internet age. Young people know that to approach climate justice, we must form a totally new system of thinking. It must be one that directly acknowledges and acts against the patriarchal, white supremacist and imperialist extractive model that has for so long continued to put profit before the planet and its people. To properly implement climate protection, we need to dismantle the very system that’s responsible for the breakdown we’re facing. This is best shown by the fact that one third of those taking strike action are living in poverty and all of us will suffer the effects of climate change. We know that our economy must be realigned along environmental and equitable principles. Excitement is building in the US around a Green New Deal, a radical policy plan to mitigate climate breakdown through the creation and enrichment of the environmentally sustainable labour sector. This will involve a just transition that provides good, meaningful and secure jobs in the environmental and renewables sectors to workers from currently high emission industries. This isn’t a case of environment or jobs, its a marriage of the two to form a better world. Here on this side of the Atlantic, momentum for such an idea is bubbling away under the surface. The UK Student Climate Network is calling for the introduction of a Green New Deal as the first demand of this movement. We’re the generation that has grown up in the shadow of the 2008 financial crash; our economic security has never been totally clear. Young people are embracing the Green New Deal from Los Angeles to Liverpool. We’re seizing the opportunity to shape a world with utmost consideration, not just for what’s ecologically responsible, but how this protection can be extended to ensure social and societal inequity is broken down. Our movement is dynamic, that’s what makes it exciting. We understand how participation and enthusiasm can change levels and form therefore we seek to guide policy reform through a set of five principles. They will act as minimum standards that institutions of political and economic governance must sign up for in their endorsement of a Green New Deal. These principles can be found at ukscn.org/green-new-deal. We are fighting for a holistic and inclusive approach and as such the groups uniting behind it must mirror such variety. We invite everyone and seek to empower, uplift and value all voices, especially those which have historically been removed from such vital dialogue. See you on the streets. George Bond is a 16-year old from Devon and a representative of the UK Student Climate Network.